Red Horse Constructors Project Manager Tom Knapp describes the homes his company builds as the “crème de la crème or you could say we build big beautiful custom homes,” says Knapp, who has just completed the pouring of the slab foundation for a crème de la crème home located in Napa Valley. The foundation is 12,000 square feet including the patio areas; the home is 8,500 square feet. It’s a linear design, 230 feet by 25 feet with two “arms” or wings that extend out 75 feet long and 25 feet wide. The roof will be flat on this single-story steel structured home. 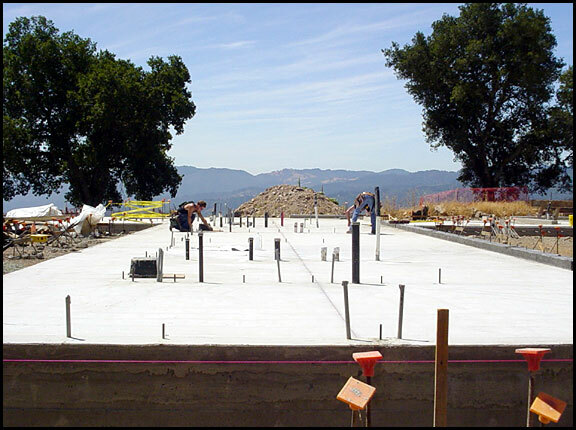 Red Horse Constructors have been in business for 20 years and build upscale custom homes throughout the Bay Area including Marin, Portola Valley and the South Bay. They rebuilt homes that were destroyed in the Oakland Hills firestorm. This home has a unique wrinkle in the plumbing design. “There is a commercial application for the heating and air conditioning,” explains Knapp, “a geothermal field feeds the heat pumps to the air handlers and to produce instant climate control. If it’s 100 degrees outside, within minutes after entering the house and turning on the system, it will be cool inside.” LeDuc & Dexter’s Bill Zeeb and Rob Main designed the plumbing for this system. Other unique features included in this Red Horse Constructors home are hardwood floors and Fleetwood windows, French limestone floors in the bathrooms, family room, wine room and media room. There will be a vanishing edge swimming pool and tennis court. Knapp will also build a 5′ by 5′ concrete and limestone tub with heating controls and jets for this crème de la crème home.